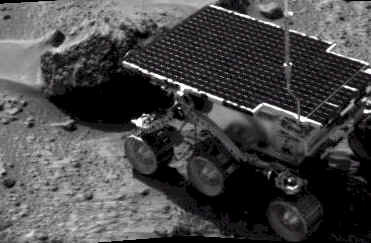 The arrival on Mars of the Pathfinder robotic planetary exploration vehicle with it's diminutive rover Sojourner on July 4, 1997 was a landmark event in the history of wireless remote control. After nearly 100 years of development, a technology with roots in an instrument of war had begun to fulfill what may be its greatest potential—helping mankind to establish a virtual presence on other worlds. For the first time ever, a person on Earth could visit an object on a distant planet and by reaching out through the medium of radio, touch it. The Sojurner Rover examines a Mars rock named "Barnacle Bill." While the Pathfinder Mars landing demonstrated a peaceful application of remote-control technology, the earliest developments in unmanned vehicles took place within the context of weaponization. 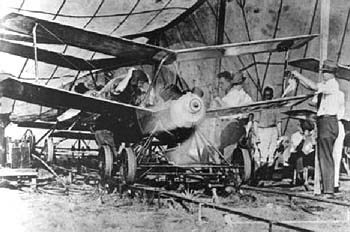 One of the first such devices, created during World War I, was a small propeller-driven aircraft called the Kettering Aerial Torpedo. This 530 pound flying bomb, nicknamed the "Bug," was launched off guide rails towards it's intended target. It's primitive in-flight guidance system provided only stability and no real directional control. Upon reaching it's destination a preset timing mechanism would cut the plane's four cylinder gas engine after which the wings would be disconnected and the bomb-bearing fuselage would fall to earth, detonating on impact. It was observed by William Wolf, in his monograph German Guided Missiles - Henschel Hs 293 and Ruhrstahl SD 1400X "Fritz X", that the guidance systems of the V-1 "Buzz Bomb" and the V-2 stratospheric rocket were so rudimentary that a successful launch was one "which hit a target as vast as London." It's now known that Germany deployed a number of more advanced guided strike weapons that saw combat before either the V-1 or V-2. They were the radio-controlled Henschel's Hs 293A and Ruhrstahl's SD1400X, known as "Fritz X," both air-launched, primarily against ships at sea. The Ruhrstahl SD 1400 'Fritz X' Air-to-Ship, Wireless Guided, Gliding Bomb. Of the fifteen battleships lost to airpower, one of these—the 41,650-ton Italian flagship, Roma—was sunk by a Fritz X. The British battleship Warspite was put out of commission for 6 months by this weapon. Fritz Xs also hit the cruiser USS Philadelphia, heavily damaged the cruiser USS Savannah, and sank the Royal Navy light cruiser Spartan. A Henschel Hs 293 Air-to-Ship Wireless Guided Bomb with belly-mounted liquid fuel rocket engine. The Henschel Hs 293 was responsible for the world's first successful guided missile attack, sinking the British sloop Egret on August 27, 1943. The weapon initially possessed an 18-channel radio control system and was flown in the same way as a radio-controlled airplane. Wire guidance was subsequently adopted when it was discovered the bomb's radio receiver was vulnerable to electronic countermeasures. During World War II in the European Theater the U.S. Air Force experimented with three basic forms radio-control guided weapons. In each case, the weapon would be directed to its target by a crew member on a control plane. The first weapon was essentially a standard bomb fitted with steering controls. 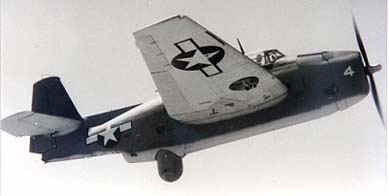 The next evolution involved the fitting of a bomb to a glider airframe, one version, the GB-4 having a TV camera to assist the controller with targeting. The third class of guided weapon was the remote controlled B-17. Remote-control or "stand-off" weapons were also used in the Pacific. The TDR-1 Assault Drone carried a 2,000 lb. 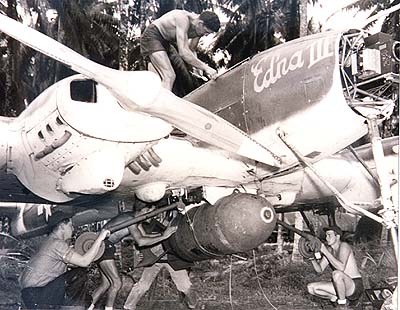 bomb load or torpedo, and also included a TV camera for close-in guidance. The control plane carried a crew of four which included two pilots who's job it was to control the flight of the drone. 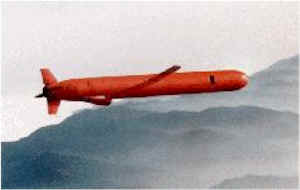 The U.S. Navy’s first tactical precision guided weapon, the Interstate TDR-1 Assault Drone made some 100 successful attacks against anti-aircraft facilities in the South Pacific. 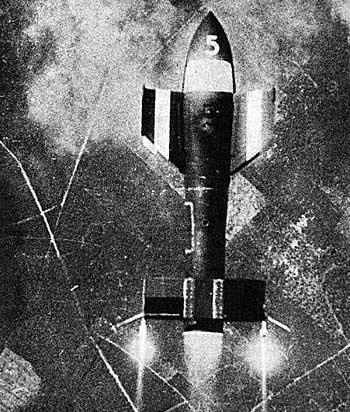 On October 27, 1944, a TDR-1 launched and staged a combat attack against such an enemy target, the success of this system marking a new era in modern warfare. During the next month, 46 similar attacks were launched against targets in the Shortland Islands, Bougainville, and Rabaul, with 21 scoring direct hits. The men behind this remarkable story formed the STAG-1/SATFOR team, who's vision, determination, and dedication in performing their secret duties during World War II laid the groundwork for the modern cruise missile. Another successful guided weapon, a glide bomb, used in the Pacific Theater was the autonomous ASM-2 BAT. It did not use radio control, rather it incorporated a sophisticated gyrostabilizer system to keep it on track as it glided towards its target and an early S-band radar system to home in on final approach. The concepts of remote control and self-directing vehicles were deeply rooted in the thinking of Nikola Tesla. Referring to my latest invention [the telautomaton], I wish to bring out a point which has been overlooked. I arrived, as has been stated, at the idea through entirely abstract speculations on the human organism, which I conceived to be a self-propelling machine, the motions of which are governed by impressions received through the eye. Endeavoring to construct a mechanical model resembling in its essential, material features the human body, I was led to combine a controlling device, or organ sensitive to certain waves, with a body provided with propelling and directing mechanism, and the rest naturally followed. His remote control vessel can be considered the progenitor of the more advanced guided weapons that were ultimately developed during World War II. The Regulus was a nuclear-armed guided missile with a range of 500 miles. The Regulus I and II guided missiles, the first operational cruise missile in the U.S. Navy, were deployed on aircraft carriers, cruisers and submarines during the 1950s. The U.S. Navy's Tomahawk cruise missile. The Tomahawk is an all-weather submarine or ship-launched land-attack cruise missile deployed by the U.S. Navy in 1983. It can self-navigate to a target by comparing the terrain beneath missile's flight path with a contour map stored in an onboard computer. After launch, a solid propellant propels the missile until a small turbofan engine takes over for the cruise portion of flight. Tomahawk is a highly survivable weapon. Radar detection is difficult because of the missile's small cross-section and low altitude flight. Similarly, infrared detection is difficult because the turbofan engine emits little heat. Systems include Global Positioning System (GPS) receiver; an upgrade of the optical Digital Scene Matching Area Correlation (DSMAC) system; Time of Arrival (TOA) control, and improved 402 turbo engines. This small, winged AGM-86B/C cruise missile is also powered by a turbofan jet engine that propels it at sustained subsonic speeds. After launch, the missile's folded wings, tail surfaces and engine inlet deploy. The AGM 86B is then able to fly complicated routes to a target through use of a terrain contour-matching guidance system. The AGM 86C uses an onboard Global Positioning System (GPS) coupled with its inertial navigation system (INS) which allows the missile to guide itself to the target with pinpoint accuracy. The RQ-1A Predator is a long endurance, medium altitude uninhabited aerial vehicle (UAV) designed for surveillance and reconnaissance missions. It has been given strike capability with the addition of the Hellfire-C laser-guided missile. The Predator has a Ku-band satellite data link to provide over-the-horizon mission capabilities. As well as the satellite data link system, Predator carries a stabilized gimbals fitted with two color video cameras and a forward looking infra-red (FLIR) as well as a synthetic aperture radar. The synthetic aperture radar (SAR) provides Predator with an all-weather, through-the-clouds surveillance capability. The surveillance imagery can be distributed in real time both to the front line soldier and to the operational commander for strike planning, target identification and location, search and rescue and battle damage assessment. A typical Predator system configuration would include four aircraft, one ground control system and one Trojan Spirit II data distribution terminal. The Predator air vehicle is 27 ft. in length and has a 49 ft. wingspan. The system operates at an altitude of 25,000 ft. and at a range of 400 nautical miles. The AGM-114 HELLFIRE missile is an anti-armor air-to-ground precision guided weapon with a shaped charge warhead providing heavy anti-armor capability. The first three generations of the HELLFIRE missile use a laser seeker, with guidance being provided through automatic terminal homing on laser signals reflected from a laser designated target. 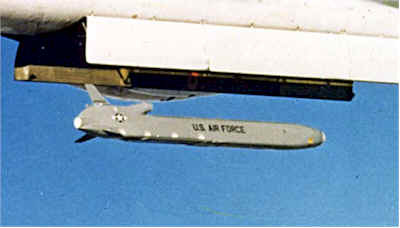 The fourth generation, Longbow HELLFIRE, uses a radar frequency seeker. The tactical missiles are propelled by a single stage, single thrust, solid propellant motor. When thrust exceeds 500 to 600 pounds, the missile leaves the launch rail. Based on a 10g acceleration parameter, arming occurs between 150 to 300 meters after launch. Maximum velocity of the missile is 950 miles per hour. Maximum standoff range is a function of missile performance, launch platform altitude versus target altitude, visibility and cloud cover. Remote designation allows the launch aircraft to stand off at greater distances from the target. This standoff range can be out to the maximum missile effective engagement range (up to about 8 kilometers at launch elevation). The Global Hawk high altitude, long endurance unmanned reconnaissance aircraft. The RQ-4A Global Hawk is a high altitude, long endurance unmanned aerial reconnaissance system built to provide high resolution, near-real-time imagery of large geographic areas. The aircraft has a maximum operating altitude of 65,000 feet, and uses a suite of high resolution sensors, including visible and infrared electro-optical systems and synthetic aperture radar. A 10 inch reflecting telescope provides common optics for infrared and electro-optical sensors. The synthetic aperture radar and ground moving target indicator (GMTI) operates at X-band with a 600 MHz bandwidth, and 3.5 kW peak power. The system can obtain images with three foot resolution in its wide area search mode and one foot resolution in its spot mode. In a 24-hour time period surveillance can be conducted over an area of 40,000 square nautical miles. The 14,000 nautical mile range and 42 hour endurance of the air vehicle, combined with satellite and line-of-sight communication links to ground forces, permits world-wide operation of the system. In April 2001, Global Hawk made aviation history when it completed the first non-stop flight across the Pacific Ocean by an unmanned, powered aircraft, flying from Edwards AFB, California, to the Royal Australian Air Force Base, Edinburgh, South Australia. Global Hawk successfully participated in a series of exercises with the RAAF, the Royal Australian Navy and the U.S. Navy. Guinness World Records has recognized the flight as the longest (13,840 km) by a full-scale unmanned aircraft. The complete system consists of the air vehicle and a ground station, including a mission control element. Global Hawk is equipped with an Allison AE 3007H turbofan engine mounted on the top surface of the rear fuselage section with the exhaust between the V-shaped tail wings. Electrical power is supplied by a Smiths Aerospace generator system. The aluminium fuselage contains pressurized payload and avionics compartments. The wings and tail of the aircraft are of graphite composite construction. The V-configuration of the tail provides a low radar and infrared signature. The wings have a span of 116.2 feet, with hard points for external pods up to 1,000 pounds each. An enhanced wing, one of a number of system improvements, will allow the UAV to carry an increased payload. The nose landing gear, a derivative of the F-5 design, is height adjustable to suit the runway characteristics. The full landing gear automatically retracts at an altitude of 4,000 feet. Global Hawk has wide band satellite data links and line of sight data links. The "bulge" at the top front surface of the fuselage houses the 48 inch Ku-band wideband satellite communications antenna. Data is transferred by Ku-band satellite communications, X-band line-of-sight links and both Satcom and line of sight links at UHF-band. The mission control ground station includes a shelter measuring 8 x 8 x 24 feet, housing the communications, command and control, mission planning and image processing computers with four workstations for the mission control team. The vehicle's flight control, vehicle management software and navigation functions are managed by two Integrated Mission Management Computers (IMMC). The IMMC integrates data from a Global Positioning System (GPS) and an Inertial Measurement Unit (IMU) and uses Kalman filtering algorithms. The control station has data up- and down-links to the Global Hawk vehicle directly and via the Ku satellite and the UHF satellite systems. The launch and recovery ground station is housed in an 8 x 8 x 10 foot shelter equipped with two workstations and the launch and recovery mission computers, along with it's own data up- and down-links. 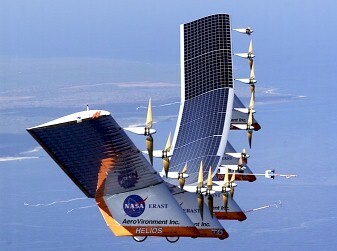 The solar-powered Helios Prototype is a slow-flying ultralight flying wing designed for long-duration, high-altitude Earth science or telecommunications relay missions in the stratosphere. The craft has a wingspan of 247 feet, longer than the wingspan of the Boeing 747 jetliner, yet weighs in at only 1,322 pounds empty. The cruising speed of Helios ranges from 19 to 27 mph, with takeoff and landing equating to the average speed of a bicycle. It's constructed mostly of composite materials such as carbon fiber, graphite epoxy, Kevlar, styrofoam, and a thin, transparent plastic skin. The all-wing aircraft is assembled in six sections, each about 41 feet long. An underwing pod is attached at each panel joint to carry the landing gear, the battery power system, flight control computers, and data instrumentation. The five aerodynamically shaped pods are made mostly of the same materials as the wing itself, with the exception of the transparent wing covering. Two wheels on each pod make up the fixed landing gear-rugged mountain bike wheels on the rear and smaller scooter wheels on the front. The Helios Prototype is powered by 14 brushless direct-current electric motors mounted across the wing's entire span. The motors are rated at 2 hp. (1.5 kW) each, and drive lightweight two-blade propellers of 79-inch diameter. The propellers are made from advanced composite materials and a laminar-flow design for efficiency at high altitudes. An array of more than 65,000 bi-facial silicon solar cells mounted on the upper surface of Helios' wing is capable of producing a maximum output of about 35 kilowatts power at high noon on a summer day. The cells convert about 19 percent of the solar energy they receive into electrical current. For long duration missions, the solar cells will be assisted by an on-board fuel-cell based energy storage system now in development. Excess electrical energy generated by the solar arrays during the daytime will be diverted to the hydrogen-oxygen fuel cell energy storage system, which will release the electricity to power the Helios after dark. The only flight control surfaces used on the Helios Prototype are 72 trailing-edge elevators that provide pitch control. Spanning the entire wing, they are operated by tiny servomotors linked to the aircraft's fight control computer. To turn the aircraft in flight, yaw control is applied by applying differential power on the motors--speeding up the motors on one outer wing panel while slowing down motors on the other outer panel. The Helios Prototype is controlled remotely by a pilot on the ground, either from a mobile control van or a fixed ground station that is equipped with a full flight control station and consoles for systems monitoring. The craft has a differential Global Positioning Satellite (GPS) system to improve navigation, an extensive turbulence monitoring system payload to record structural loads on the aircraft both in the air and on the ground, and radiator plates to assist in cooling the avionics at high altitudes where there is little air to dissipate heat. A flight termination system, required on remotely piloted aircraft flown in military restricted airspace, includes a parachute system deployed on command, plus a homing beacon to aid in the aircraft's location. In case of loss of control or other contingency, the system is designed to bring the aircraft down within the restricted airspace area to avoid any potential damage or injuries to fixed assets or personnel on the ground. Production versions of the Helios are expected to fly missions lasting months at a time, becoming true "atmospheric satellites." 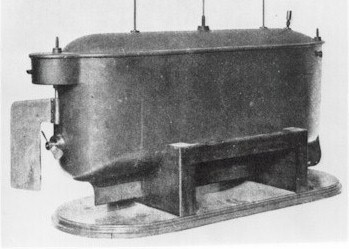 Nikola Tesla's radio controlled telautomaton. This propeller-driven radio controlled boat, built by Nikola Tesla in 1898, is the original prototype of all modern-day uninhabited aerial vehicles and precision guided weapons—in fact, all remotely operated vehicles—air, land or sea. Powered by lead-acid batteries and an electric drive motor, the vessel was designed to be maneuvered alongside a target using instructions received from a wireless remote-control transmitter. Once in position, a command would be sent to detonate an explosive charge contained within the boat's forward compartment. The weapon's guidance system incorporated a secure communications link between the pilot's controller and the surface-running torpedo in an effort to assure that control could be maintained even in the presence of electronic countermeasures. To learn more about Tesla's system for secure wireless communications and his pioneering implementation of the electronic logic-gate circuit read Nikola Tesla — Guided Weapons & Computer Technology, Tesla Presents Series Part 3, with commentary by Leland Anderson.